Long before Hurricane Katrina, most experts knew the city of New Orleans was vulnerable. Situated up to 3.7 meters (12 feet) below sea level, between a lake and a river, and on the hurricane-prone Gulf Coast, the city was arguably a disaster waiting to happen. 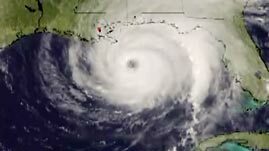 This video segment adapted from NOVA scienceNOW describes the threat Hurricane Ivan posed just one year before Katrina — an ominous foreshadowing of one of the country's worst natural disasters. This resource was adapted from NOVA scienceNOW: "Hurricanes." Humans have been altering the natural environment to suit their needs for thousands of years. We've constructed shelter where none existed, planted food crops where forests once flourished, and in one of the more striking examples, built an entire city in the middle of a swamp. New Orleans, Louisiana, is a testament to the human will and ingenuity required to overcome seemingly impossible odds — in a part of the world where a great deal of commerce stood to be gained. However, in August 2005, Hurricane Katrina tragically illustrated the potential consequences of defying the forces of nature. New Orleans sits in the middle of an ancient floodplain of the Mississippi River. Periodically, this mighty river, like most wild rivers, overflowed its banks, inundating the surrounding area. What was a natural and necessary occurrence for the wetland ecosystem of the Gulf coast threatened the viability of communities along the banks of the Mississippi. In response to this threat, people, as part of a government plan, began building a system of levees to heighten the river's banks and protect themselves from flooding. 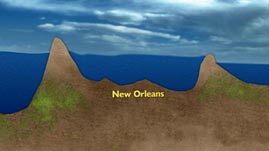 Ironically, the centuries-old effort to control seasonal river flooding in New Orleans and other coastal cities has made the same communities increasingly vulnerable to ocean flooding from tropical storms and hurricanes. Wetlands along the Gulf coast provide the first line of defense against deadly hurricanes, by both limiting the storms' access to the warm open ocean water that drives them and by creating a physical barrier to the floodwaters, or storm surges, that they generate. Yet, coastal wetlands have been deteriorating and shrinking for decades because they no longer receive the influx of sediment and nutrients that periodic river flooding once provided. The bottom, or substrate, of coastal wetlands is unstable. It settles and sinks continuously. Without a steady supply of new sediment and nutrients, wetland plants soon become flooded themselves, causing expanses of open water to form. As a result of Mississippi River flood control, together with the opening of shipping channels that have caused saltwater to infiltrate freshwater wetlands, Louisiana has lost nearly 5180 square kilometers (2,000 square miles) of coastal wetlands, an area the size of the state of Delaware, in the last 70 years. As this trend continues, the likelihood that another hurricane will devastate the Gulf Coast region only increases. 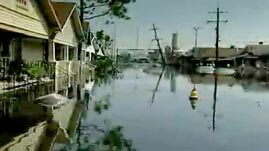 To learn what happened when a Category 4 hurricane struck New Orleans, check out Hurricane Katrina: Wetland Destruction, Hurricane Katrina: A Scientist's Response, Hurricane Katrina: Possible Causes. To learn about the equipment and methods scientists use to predict hurricanes, check out Hurricanes: New Tools for Predicting. To learn more about how hurricanes form, check out How Hurricanes Form and Earth System: El Niño's Influence on Hurricane Formation. Explain the process that has led to New Orleans becoming a "bowl." What is a storm surge? Why is a storm surge particularly dangerous when a hurricane hits New Orleans? 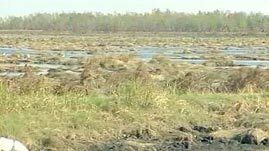 Wetlands around New Orleans are disappearing. What effect does this have upon the storm surge of a hurricane? What role did draining swampland and creating levees around New Orleans have upon its vulnerability to hurricanes? What aspects of New Orleans make it so vulnerable to being devastated by a large hurricane? Thousands of Filipinos made homeless by Typhoon Haiyan are ordered to relocate. Mexico may make gum chewers pay to clean up litter. A non-profit in Mexico City suggests using rainwater harvesting to remedy the city's water shortage. The Central American nation is set to become the first in the region to outlaw sport hunting. Do we have what it takes to stop catastrophic warming? Bird poop could help clouds form, keeping our planet a little bit cooler. The catastrophic collapse of the ground beneath our feet is a growing worldwide hazard. Trek across this interactive map, collecting geological clues that tell the story of our continent. The Korean oceanographer and spokesman for the disabled talks about the blessings of a debilitating accident. Biophysicist Jack Griffith takes you on a narrated photo tour of quarter-billion-year-old water bubbles. MIT geologist Sam Bowring muses on mass extinctions and why we can't take Earth's hospitable climate for granted. Can new weather radar networks spot tornadoes earlier and thereby save lives?